SSTA: 7th Pay Commission: Latest News, Update on Hike in Minimum Pay, Fitment Factor Beyond CPC For Central Government Employees!!! 7th Pay Commission: Latest News, Update on Hike in Minimum Pay, Fitment Factor Beyond CPC For Central Government Employees!!! 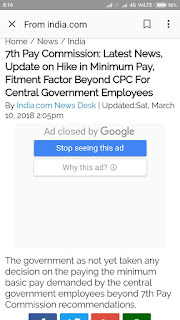 The central government employees have been waiting too long for a hike in minimum pay and fitment factor beyond the recommendations of the 7th Pay Commission or 7CPC. However, the government as not yet taken any decision on the paying the minimum basic pay demanded by the central government employees beyond 7th Pay Commission recommendations. All we know so far is the government has been considering automatic pay revision mechanism when Dearness Allowance (DA) will rise above 50 per cent. According to the reports, the hike in minimum pay and fitment factor beyond what has been recommended in the 7th Pay Commission would be done when the Dearness Allowance rises above 50 per cent. It has also been reported that the government will not use the mechanism of pay commission every 10 years to hike the salaries of government employees. The recent Punjab National bank fraud over Rs 11,000 crore might also act as a hindrance in getting a rise in minimum pay and fitment factor beyond the recommendations of the 7th Pay Commission. It is also likely that the government may consider hike but not as much as have been demanded by the central government employees. Considering that the Maharashtra government too has cleared arrears payment based on 7th Pay Commissionreport for employees this year, the government might take a decision by April 1. 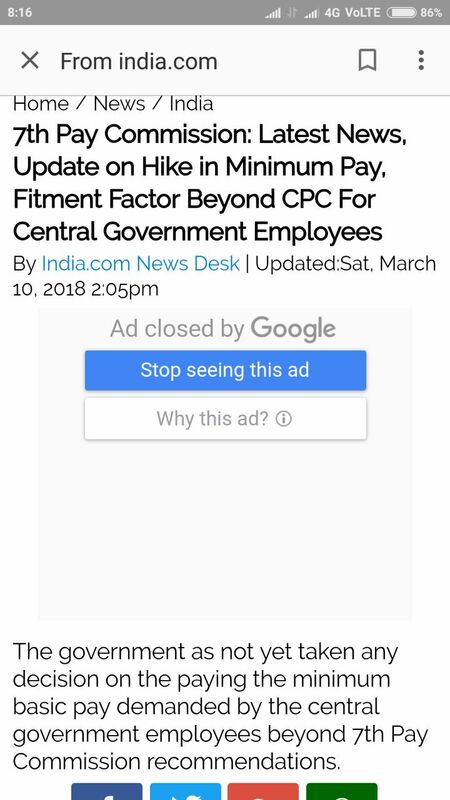 Earlier it was reported that minimum pay and fitment factor beyond 7CPC is likely to be done from April 1. In fact, it was also reported that the finance ministry has finally formed a panel which would look into and take a final call on the hike in minimum pay and fitment factor beyond the recommendations of the 7th Pay Commission or 7CPC.